For over 35 years I've had the pleasure of creating custom art works for individuals and commercial clients, from man caves to grand walls in bank lobbies, medial centers, corporate offices, facilities and airports. 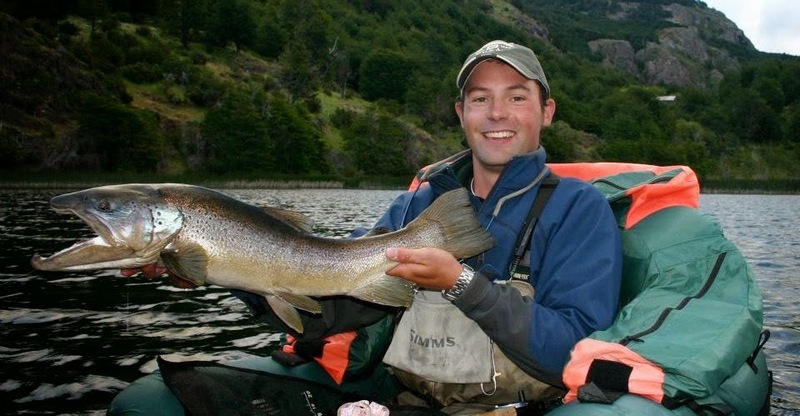 These days my work has found a lot of interest in the Fly Fishing world, with many of my works finding homes on the walls of fly tier's work shops and fishing lodges around the globe. Here's one of my latest originals created for fly tier extraordinaire, Lin Akey of Whitefish, Montana. The fly here is one of his signature fly's "The Sheep Creek Special". 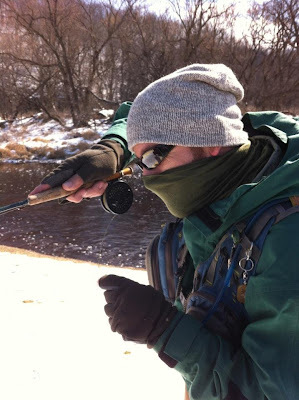 You may see Lin fishing the stretch of the Upper Missouri around Craig MT working this fly in some of his favorite drifts, with considerable success I may add. "Ake's Sheep Creek Special" joins the Tom Hanson Collection of prints, and is now available in Note Card and the Signature Collection and will be released as a Collectors LTD Edition Print in 2014. My 12th and Final Winner of my Free Print Giveaway is Mark Richard, of Spokane, WA. 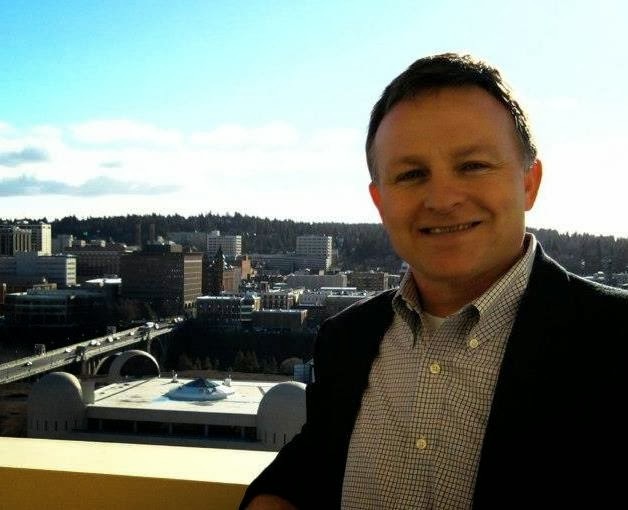 Mark comes to me via Facebook and LinkedIn, proving that participating in these social network platforms do have additional benefits. Mark's choice is my Royal Wolf 1 Fly Print, which is one of my most popular. 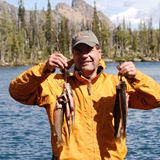 If your from the Spokane Area, you may know Mark as a community leader and proponent of Downtown Spokane, and an active fly fisherman. Thanks Mark, for following my Tom Hanson Artist Page and being a LinkedIn contact. Thank you to all that participated in my 12 month Giveaway in celebration of my 35th Anniversary of Tom Hanson Arts. I'm presently putting together the details on my 2014 promotion, so don't fret, you may be a winner in the New Year! I'd like to wish you all a Happy New Year and may 2014 be a great year for us all! I'm excited to offer these 4 new canvases available for sale. 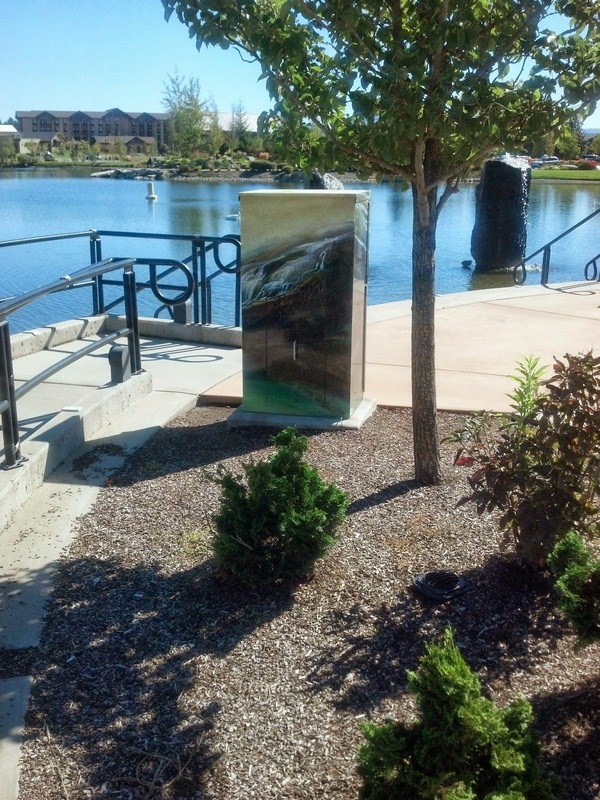 Each piece is an original painting on canvas, gallery wrapped with a masonite backing, they feature a soft metallic wash and are finished with an acrylic varnish, making the piece very durable. The canvases can be purchased at my online store, go to Tom Hanson Arts Online Store. Scroll to the bottom of the page to find the original paintings. November's Free Print Winner is Kay Dell Parratt. This months Winner of my Free Print Giveaway is another familiar face from my past, isn't Facebook cool, it's really brings people back in touch after many miles and years. I was tickled to see Kay Dell's name come up while drawing this months winner, as this wonderful lady was my Boy's Home Economics teacher at Great Falls High School in my home town of Great Falls, Montana. I consider myself to be extraordinarily lucky to have had a number of world class educators in my school years, and Kay Dell was one of those. One of those rare times when you couldn't wait to get to class to see what was going to happen that day. 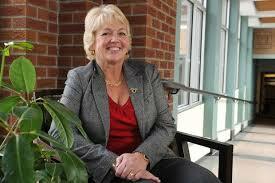 If you had Kay Dell as an instructor, you know exactly what I mean. Thanks Kay Dell for following my Tom Hanson Artist Page on Facebook, and thanks for your kind support over the years. I have one more month left in my Free Print Giveaway, you can still enter your name by "liking" my page mentioned above, or send me a response and I can add your email address, Good Luck!!! I'm excited to announce that large prints on canvas are now available. Royal Coachman giclee print on canvas, actual size of the original. 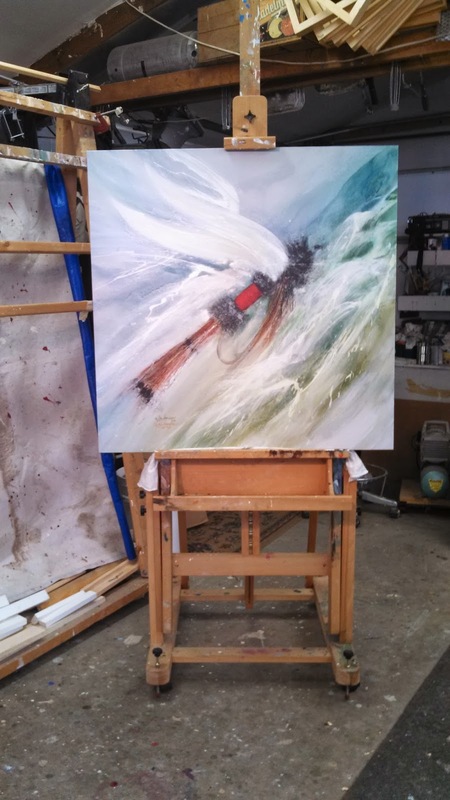 The Large Format Prints on Canvas are the size of the original paintings. In the case of the piece above, 36" x 36", and go up to 36" x 48" for the image Abstract Fly 3. Visit the Collectors Edition on Canvas now available. The canvas prints are Limited Editions signed and numbered with Certificates of Authenticity. October's Free Print goes North to Alaska! This months winner of the Free Print Giveaway is Michael Cole of Juneau, Alaska. 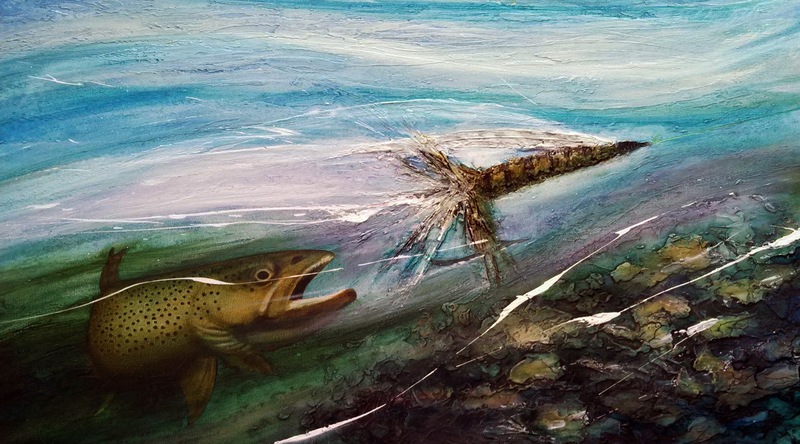 Michael's print of choice is Caddis 1, thanks for following my Tom Hanson Artist Page on FaceBook. 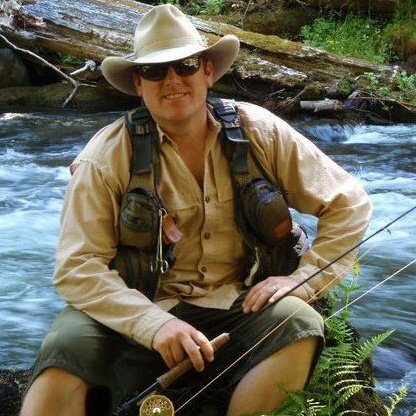 By the looks of the catch on Michael's line, he's a guy who knows his way around a Fly Rod, by the way, he works at Alaska Fly Fishing Goods in Juneau . There are two months left of my Free Print Giveaway, so there's still time to " like " my Tom Hanson Artist Page and get your name entered! I would like to send my thanks to the City of Coeur d'Alene's Art Commission for including me in their urban beautification Public Art program this year. 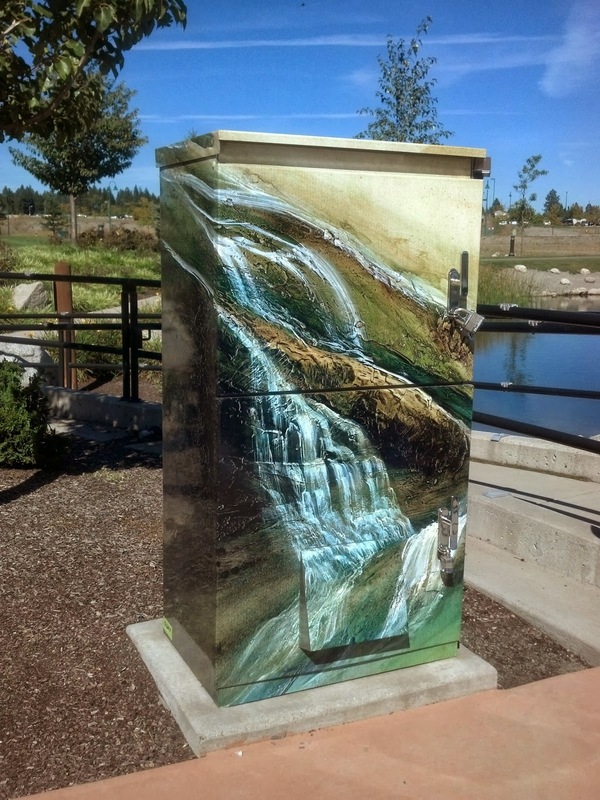 They selected my recent painting "Cascades" for the Utility Box Beautification at the Riverstone Park Pond & Amphitheater site. 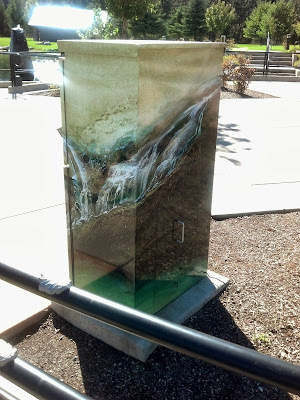 I'm thrilled to have my waterfall piece enhancing the beautiful setting here at the park. 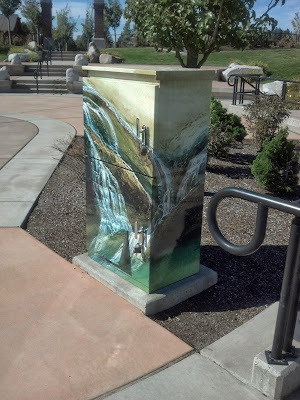 As you can see, this application brings an environmental blend of art and nature to an architectural utility box. A good fit for the setting. September's Winner of my Free Print Giveaway is Baxter Robertson, of Los Altos, CA. I was thrilled to see Baxter win this months print, Bax and I first met during the Spokane Worlds Fair in '74. I had the privilege to work with him and become friends in the following years during the Hollywood period of our lives, and what a time it was! Baxter is one of the San Francisco Bay Areas busiest musicians, musical educators, recording artists, composers and performers. Keep your eye out for this guy, he's everywhere. Thanks Bax for following my Tom Hanson Artist Page, I hope you enjoy your print! The Art & Glass Fest at Arbor Crest Winery is upon us, this weekend Sat. & Sun. the 17th & 18th from 11:00 am to 6:00 both days. If your in the Spokane Valley during the weekend, you should put this fun event at this beautiful location in your weekend plans. I'll be in booth # 40, so stop by and say hi. I'll have some new originals, framed prints and more. Pictured below is a new piece, folks that have followed me over the years will recognize the series, "The Pacifica Collection", if you visit me at the show, I'll share some fun stories on this series and where and when the inspiration evolves from. Ascending Indigo 12" x 24"
August's Winner of my Free Print Giveaway is Lynda Morin of Great Falls, Montana. This month my winner comes from my past business clients. I had the pleasure of working with Lynda when she commissioned me to create original paintings for the offices of D.A. Davidson Co. home offices in Great Falls, MT. 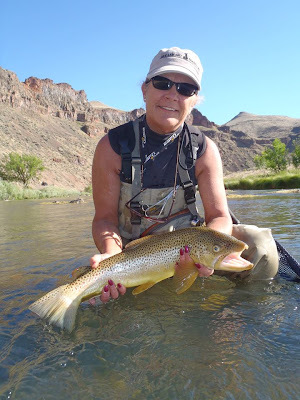 Lynda's print of choice is Lurking Lunker, one of my most popular images. Thanks Lynda for following my work and I hope you enjoy your print. There are still 4 more months left in my free print give away, you can still get your name in to the pool by Liking my Tom Hanson Artist Face Book Page or requesting your name be added to the pool, as Lynda did. Also, all my previous customers names are included in the pool as well! You may be the next Winner. Custom Art Works & July's Winner! 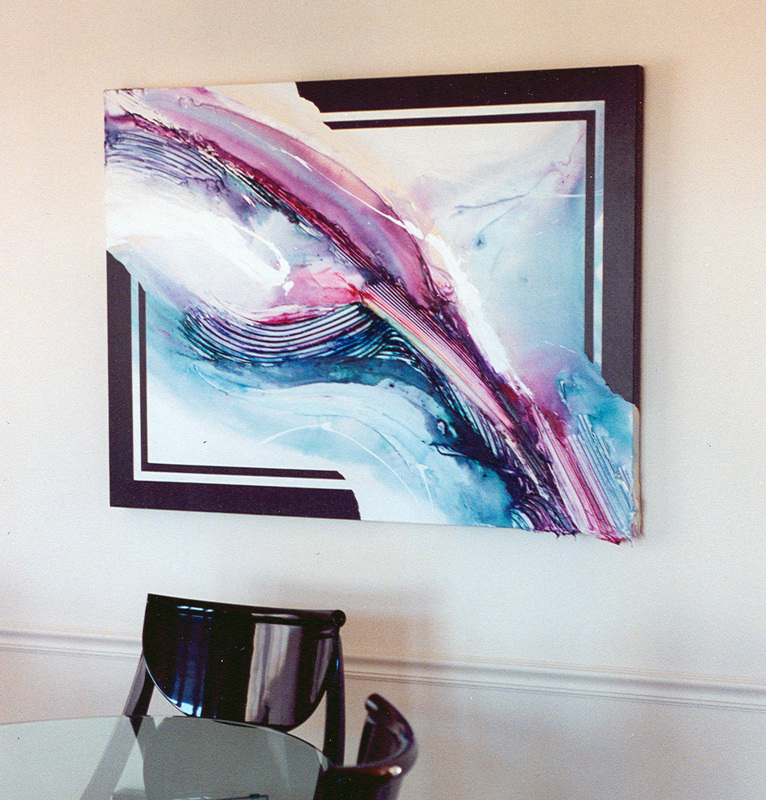 For over 35 years I've been specializing in creating custom art works for specific spaces, places, companies and individuals. 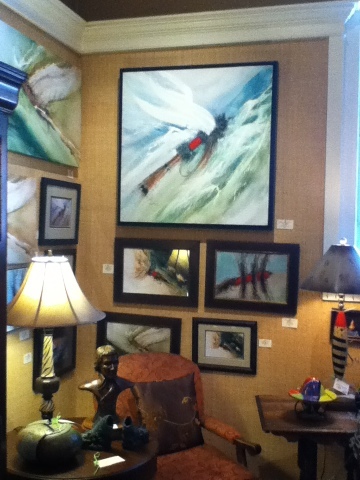 Over the years I've created landscapes, abstracts, historical subjects and industrial themed paintings and murals. 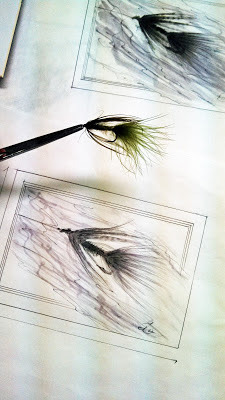 Who'da thunk that I'd find myself creating portraits of Fly Fishing Flies for Fly Tiers and enthusiasts. 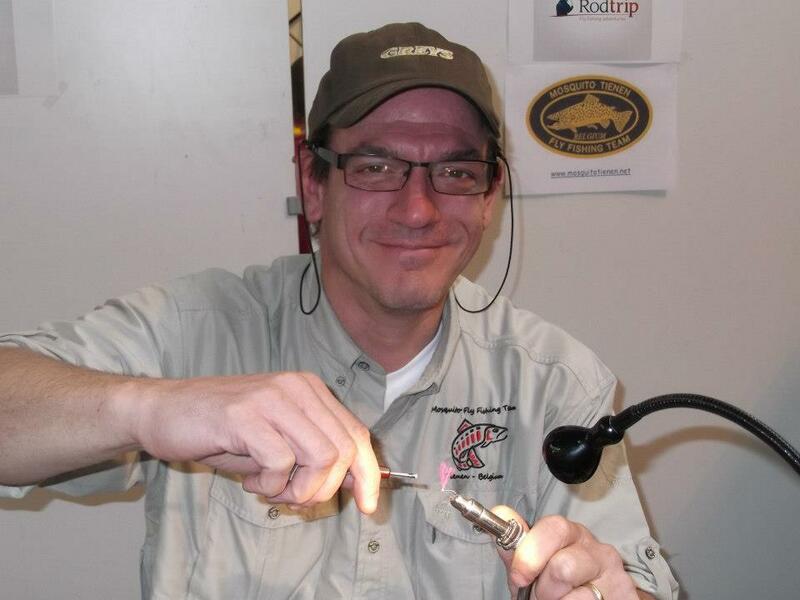 Last summer I had the pleasure of exhibiting my works at the International Fly Fishing Federation's International Fly Fishing Fair held in Spokane, WA. 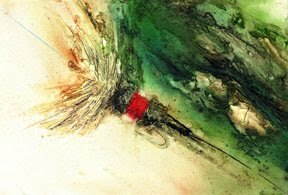 I found a considerable interest in my Abstract Fly Collection, as a result many have become collectors and some have commissioned me to create an impressionistic painting of a favorite fly. Bill Willmart of Stoney Point Flies in Heber Springs, Arkansas is one of those folks. Bill sent me a fly he calls the Deena, I worked up a rough sketch, we chose a size of 24" x 36", after several conversations I was underway. In a few weeks it was ready to ship off to Arkansas, and I'm happy to say Bill was very pleased with how things turned out. July's Free Print Giveaway goes to Padraig Green of Haiku, Maui, Hawaii. One of the cool things about this giveaway promotion is that many of the folks entered via Facebook and my other platforms are friends and acquaintances, such is the case this month. knowing them made my stay on the island a more rewarding experience. Padraig's image of choice is the P & L Special. 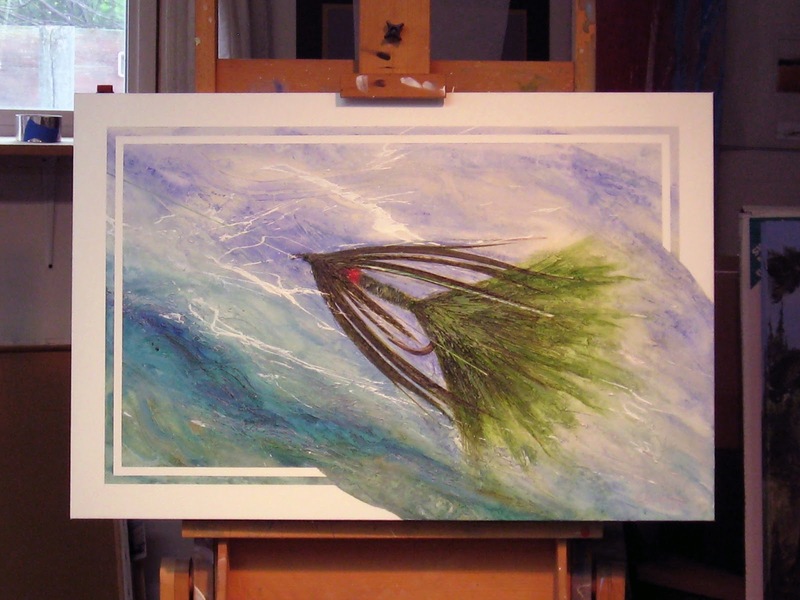 Mahalo Padraig & Willow for all your positive energy, and for following my work via Facebook. I hope we get the chance to visit again one of these days soon. The monthly Free Prints will continue through the end of the year, just Like my Tom Hanson Artist Page, or drop me a note and I'll add your name to the pool. I'll be the Featured Artist at Montana Frameworks and Gallery at 141 South Main Street, in Kalispell, Montana on Friday June 28th, 5pm till ? If your in the area, stop by as The Glacier Sun Winery will be on hand as well, A wine tasting and New Art sounds like Fun to me. I'll be previewing my latest canvas, "Glacial Cascades" and see the latest in my Framed Prints and Originals. I'm pleased to announce my association with these fine galleries. 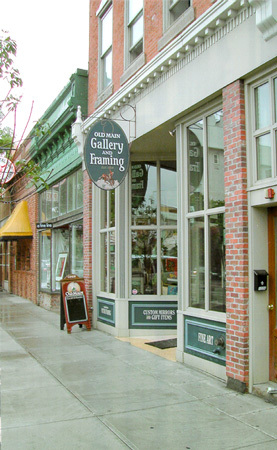 I'm thrilled to announce that the Old Main Gallery and Frame as my new dealer in Bozeman. Stop in and say hi to Jim & Lynda and staff. 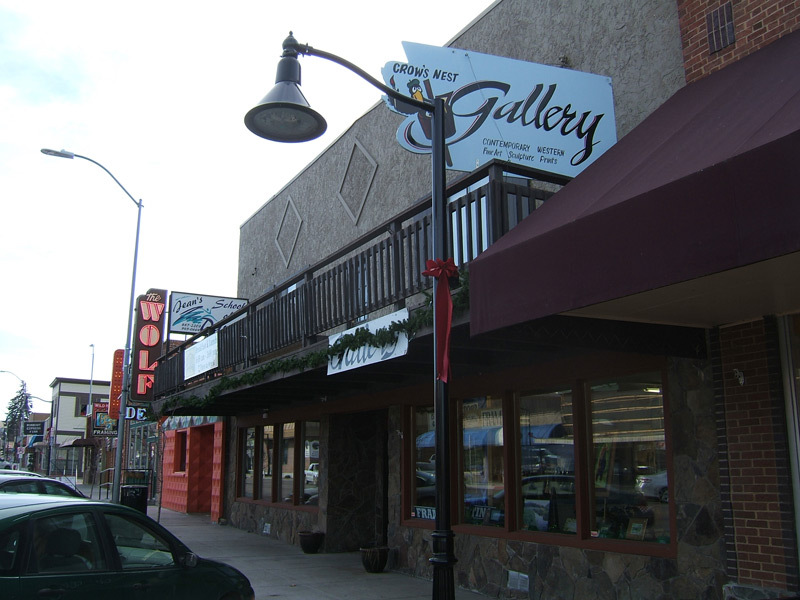 The gallery has been the go to spot for quality framing and art in Bozeman since 1964. 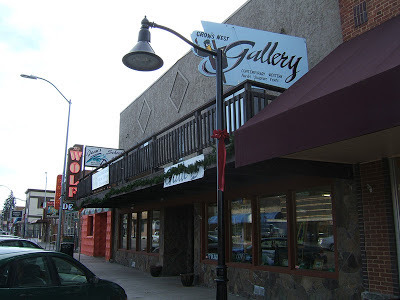 With 38 years comes a lot of experience, I'm happy to have Crow's Nest representing my work in the Polson area. Stop in and say hi to Lou when your in the area. June's Winner of my Free Print Giveaway is Patti Bantam of Boise, Idaho. 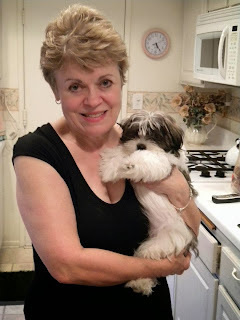 Thanks Patti, for following my Facebook page. 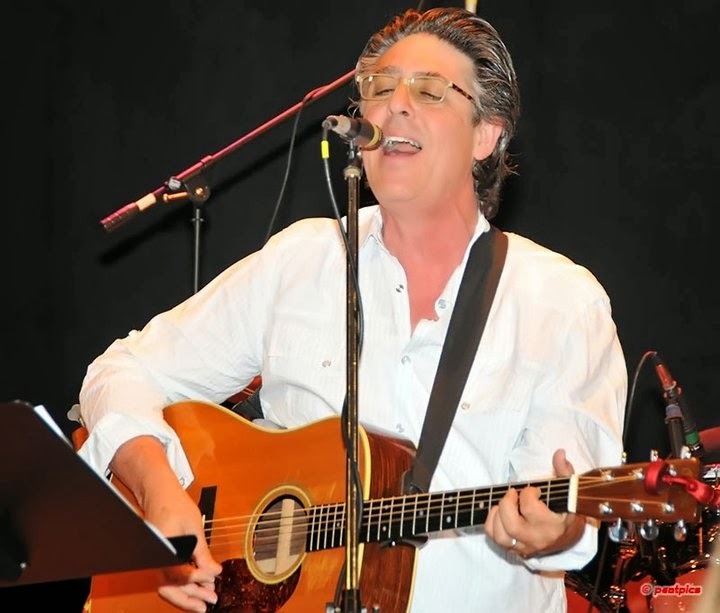 so if you haven't liked my my Tom Hanson Artist Page yet, click on the link and do so, or you can enter just by dropping me a note requesting your name be entered, that'll work to. Next month, more giveaways, events and a feature on recent Commissioned Projects I've been working on. Tom's Web Store is Back! I'm excited to announce that my Web Store is back, with a larger collection of Prints and Note Cards available for purchase through PayPal. In addition, you can contact the studio direct for a credit card purchase, when talking to Tom personally, it allows you additional package price discounts on products and shipping. contact Tom for details on Prints on Canvas. 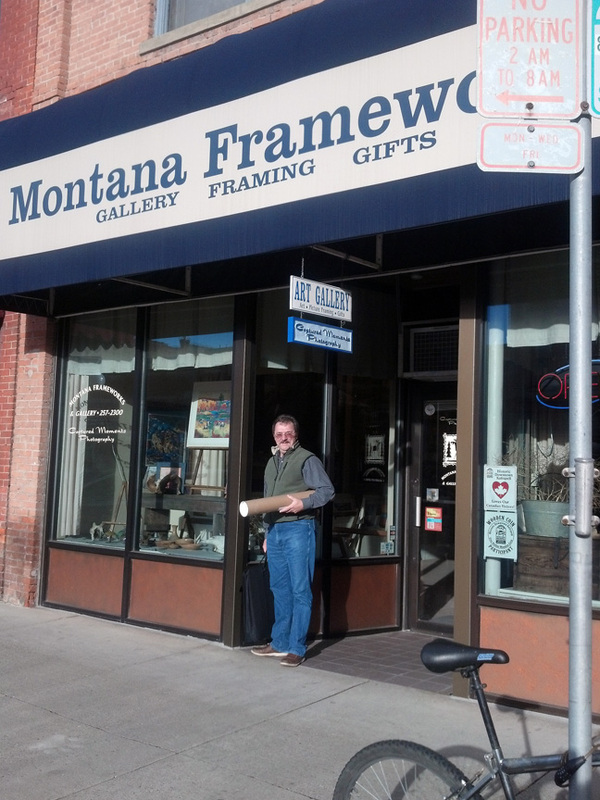 If you reside in the Inland Northwest or Montana, we can make framing suggestions with one of my frame shop dealers. April's Winner of Tom's Free Print Giveaway! Tax Day was a lucky day for Jay Kennedy of Bend, OR he's the Winner of my April Free Print Giveaway! Jay taking a break between casts! Jay's selection is the Royal Wolf 1. Thanks Jay, I hope you have a terrific season. As a reminder, I'll be giving away a free print every month in 2013 to celebrate Tom Hanson Arts 35th Anniversary in Biz and a few special events giveaways as well. So there's still a bunch of chances to win, so if you haven't got your name into the pool yet here's how you can. And if your not on Facebook, you can respond by email with a request to add your name, and that works to! So tell your friends, and thanks for following my work. Good Luck, maybe your'll be the next Winner! Trade or Barter for Tom's Art Work! Over the years I've enjoyed the opportunity of trading or bartering my art for a huge variety of products, goods and services. So I thought it would be a good idea to post this proposal to all of you that also enjoy the "Barter is Smarter Attitude". 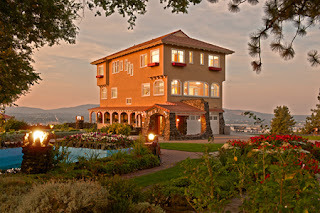 First on my List, Vacation Timeshares. Many folks often are unable to use their annual time in their plan due to scheduling, so those days and weeks go unused, and yet they're still stuck with their maintenance fees for that year. 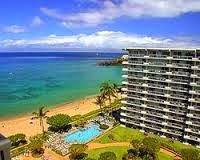 I've had great luck trading art with folks for their unused Timeshare Accommodations in the past, so if you are in this situation for this 2013 or 2014, let me know. 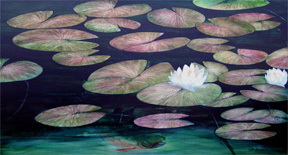 I can offer original and custom commissioned paintings as well as prints from my catalog of images. 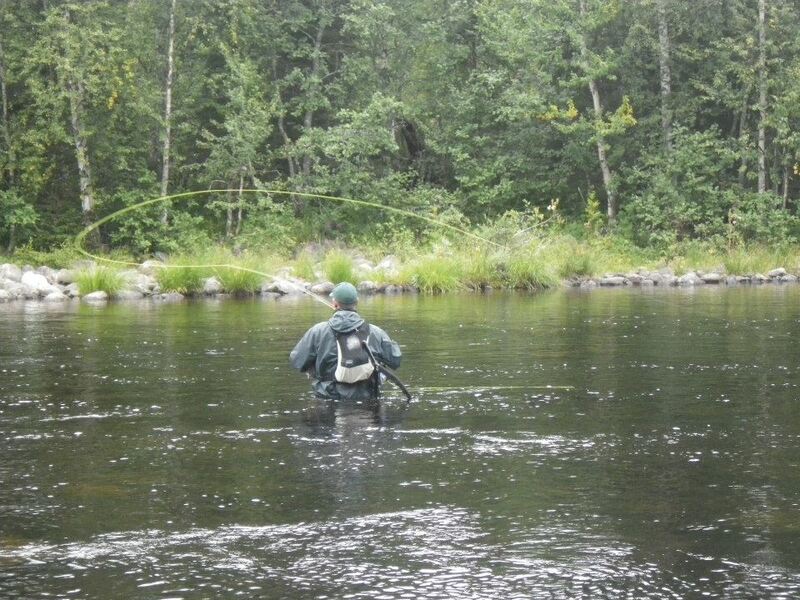 2nd, Sporting Goods, my wish list includes a new Graphite Fly Rod set up to tackle the Columbia Salmon and Steelhead runs. 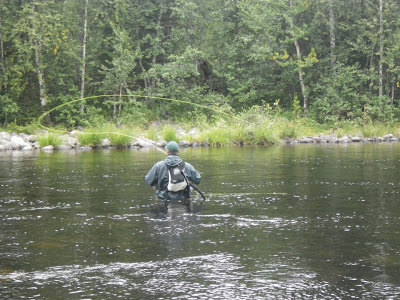 So to all the folks I met at the IFFF International Fly Fishing Fair in Spokane last July, this may be right up your alley! So, if you have goods or services that you'd like to run by me, by all means let me know, I look forward to kicking some ideas around with you. Ryan's selection is "P&L's Special"
There's 9 more drawings, so you can still win! Good Luck! hopefully it will take a little of the pain away! February's Free Print Giveaway Winner! Jamie Holman of Great Falls, Montana is the Winner for February! She has her choice of prints from the Free Print Giveaway Page, located on the right of this text. I'll be giving a free print every month in 2013, and a couple bonus gifts for special events this year, if you have your name entered! 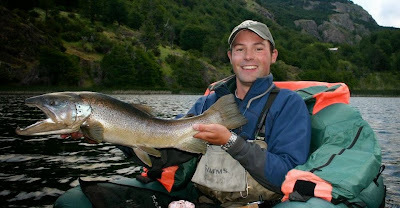 Lurking Lunker is Jamie's Choice!. Here's how I pick the winners, My business manager, Deb, picks letters from the alphabet from a fish bowl, lottery style. The first letter is the first initial on the last name or first letter in a business name, the next 3 to 4 letters are first name of an individual or next word in a biz name etc. and , and if the letter is not on the mark we choose the closest numerically to the letter chosen. So, you still have 10 chances to win! March's winner will be drawn on St. Patrick's Day! January's Free Print Winner is? 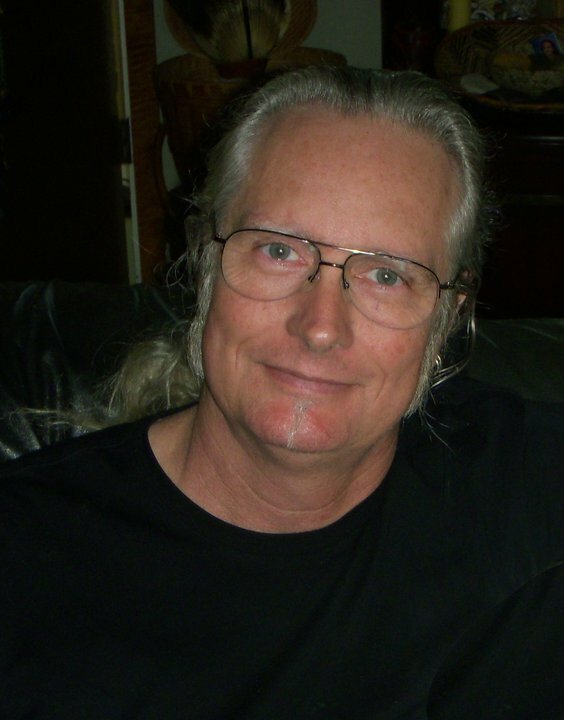 Bill Robinson, he's the first winner in my 12 month free print giveaway! 2. followers of this Blog, you can follow this blog. 3. and names from my email list whom responded with a request to enter their name but remain un-posted. Each Winner has their choice of any print from my catalog. The February drawing is on Valentines Day, so get your name in, as I'll be drawing a winner every month this year! To make sure your name is in the pool of names to be drawn from, you can do the following if you haven't already. 1. If you belong to FaceBook, go to my "click on this link" Tom Hanson Artist Page and "LIKE" the page, your name will be entered. 2. If your not on FaceBook, you can become a follower of this blog, just click on the "follower, join this site" on this page below, (not the follow by email) fill out the info required, those names are included in the pool. You can always unsubscribe later. I'll draw one name each month, allow the winner to choose the image of their print from "The Abstract Fly Collection or the Signature Edition Collection", which are linked in the "Pages" box on right of this page, and I'll send it off to them. 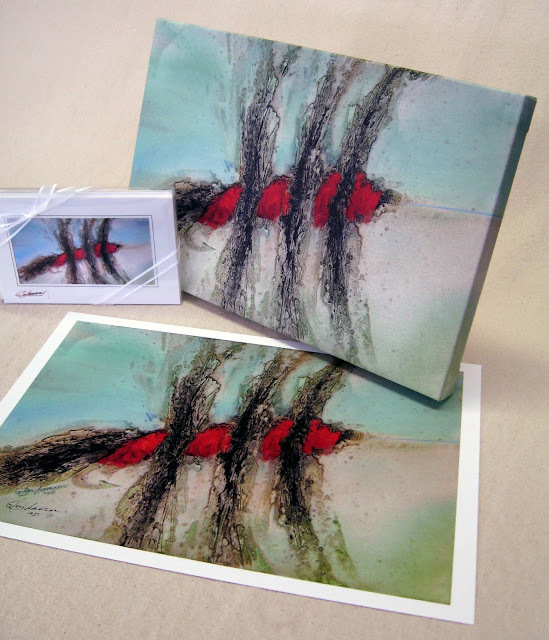 Mini print from the "Abstract Fly Collection"
These signed prints are custom printed on linen stock to fit commercial frames for 8"x10" images, or you can have your framer do a custom job! So If you haven't got your name in yet, join in the celebration, as there are 12 prints to be given away over the year...So why not get in the Game!